Researchers discover cells that regenerate the liver without forming tumours. Of all the body’s major organs the liver has the highest capacity to regenerate and that’s why many liver diseases, including cirrhosis and hepatitis, can often be cured by transplanting a piece of liver from a healthy donor. The liver’s regenerative properties were previously credited to a population of adult stem cells known as oval cells. However, the medical community concluded that oval cells don’t give rise to hepatocytes; instead, they develop into bile duct cells. These findings prompted researchers to begin looking elsewhere for the source of new hepatocytes in liver regeneration. Now, researchers at University of California, San Diego have discovered a population of liver cells that are better at regenerating liver tissue than ordinary liver cells, or hepatocytes. The team state that their study is the first to identify the so-called ‘hybrid hepatocytes,’ and show that they are able to regenerate liver tissue without giving rise to cancer. While most of the work described in the new study was performed in mouse models, the researchers also found similar cells in human livers. The opensource study is published in the journal Cell. Previous studies show that other research labs around the world are working on ways to use induced pluripotent stem cells (iPSCs) to repopulate diseased livers and prevent liver failure. While iPSCs hold a lot of promise for regenerative medicine, it can be difficult to ensure that they stop proliferating when their therapeutic job is done. As a result, iPSCs carry a high risk of giving rise to tumours. Therefore the team wanted to find a safe regenerative medical technique that held no heightened risk of cancer. To test the safety of hybrid hepatocytes the team examined three different mouse models of liver cancer. The results showed no signs of hybrid hepatocytes in any of the tumours, leading the researchers to conclude that these cells don’t contribute to liver cancer caused by obesity-induced hepatitis or chemical carcinogens. The lab surmise that although hybrid hepatocytes are not stem cells, thus far they appear to be the most effective in rescuing a diseased liver from complete failure. They go on to add that hybrid hepatocytes represent the most effective way to repair a diseased liver and the safest way to prevent fatal liver failure by cell transplantation. Compensatory proliferation triggered by hepatocyte loss is required for liver regeneration and maintenance but also promotes development of hepatocellular carcinoma (HCC). Despite extensive investigation, the cells responsible for hepatocyte restoration or HCC development remain poorly characterized. We used genetic lineage tracing to identify cells responsible for hepatocyte replenishment following chronic liver injury and queried their roles in three distinct HCC models. We found that a pre-existing population of periportal hepatocytes, located in the portal triads of healthy livers and expressing low amounts of Sox9 and other bile-duct-enriched genes, undergo extensive proliferation and replenish liver mass after chronic hepatocyte-depleting injuries. 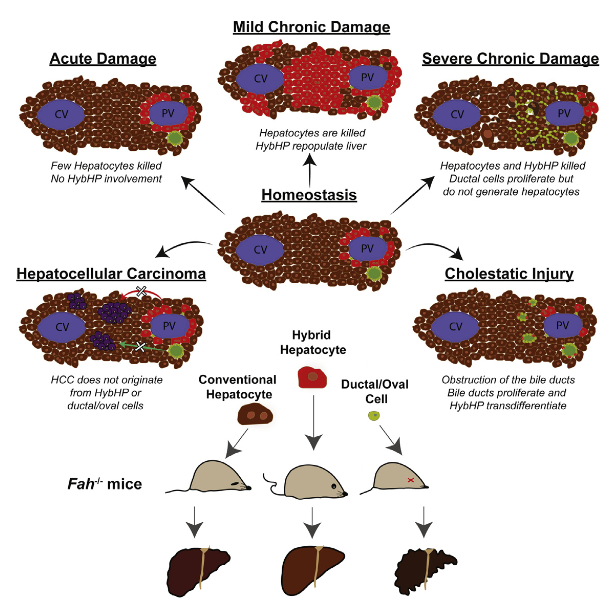 Despite their high regenerative potential, these so-called hybrid hepatocytes do not give rise to HCC in chronically injured livers and thus represent a unique way to restore tissue function and avoid tumorigenesis. This specialized set of pre-existing differentiated cells may be highly suitable for cell-based therapy of chronic hepatocyte-depleting disorders. Hybrid Periportal Hepatocytes Regenerate the Injured Liver without Giving Rise to Cancer. Karin et al 2015.